Set in the middle of Cape Breton, on the shores of the Bras d’Or Lakes and just east of the Cabot Trail, Baddeck is a town that’s impossible to skip over when visiting the island. It has just 1,000 residents but there’s plenty to keep the passing visitor entertained for anything from a few hours to a few days. Check out the local restaurants, take in a round of golf, go hiking or hit the water in a kayak. Top among Baddeck’s attractions is the Alexander Graham Bell museum. It chronicles the life of the inventor of the telephone with displays that are well thought out and appealing to all ages. On a nice day, there’s no better activity than a trip to Kidston Island. 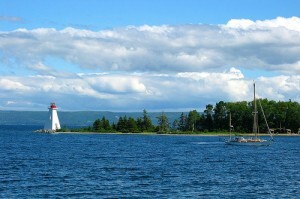 It’s just a short boat ride from Baddeck with an excellent beach. A free shuttle boat service will take you there and back in July and August.